Many of you will no doubt have heard that today, October 25, is when the big Microsoft event for the unleashing of Windows 8 is being held. It starts in just a few hours time in New York and the event will carry on for most of the day. There will be a Microsoft Windows 8 event live stream and we’ll also give you some details of live blogs available. To make sure you don’t miss a thing we also have information on worldwide times for the event. The event kicks off in New York at 10am ET and we’re expecting to hear all about the latest Microsoft Windows iteration, which will be used on desktops, ultrabooks, most tablets, hybrids and all-in-ones according to PCWorld. Nevertheless of course we always hope for more so we’re not giving up hope of hearing about new hardware too although we’ve already heard all about the Microsoft Surface tablet which will release tomorrow. If you want to follow the event then Microsoft is offering a live stream today from 11:15 am EDT at this webcast link. With the live stream you’ll be able to keep up with developments as they happen, for an hour at least, before the event continues for the rest of the day. We’ve also found a couple of live blogs available in case you choose to follow the event that way. You can head to Cnet here, where you can now see a countdown to the start of the event. Alternatively try the Seattle Times here where the live blog starts at 10am ET/ 7am PT. As far as times across the world are concerned you can check the time for wherever you are as we’ve prepared an event time announcer at timeanddate.com. 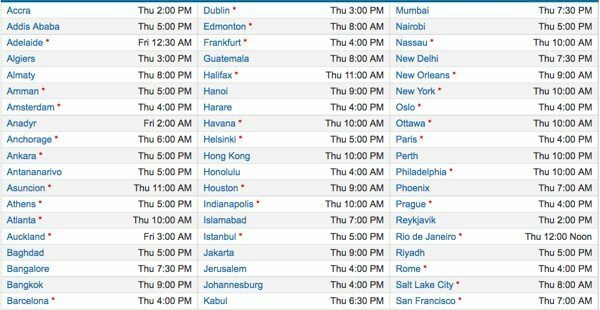 As you can see this shows cities across the globe and the time of the event in those places. For example the event is in New York at 10am so that’s 7am in San Francisco, 3pm in London, 7:30pm in New Delhi, 4pm in Johannesburg, 4pm in Paris, 10pm in Hong Kong and 11pm in Tokyo. Just check the chart for the time where you are. Because of the time difference, in some places it will be Friday rather than Thursday so for instance in Sydney it will be 1am on the Friday while in Auckland it will be 3am, also on the Friday. We’ll be following events from New York and are waiting to hear all the news although we’ve already heard plenty about Windows 8 and wonder what else Microsoft can tell us. Are you waiting for the official Windows 8 event? Will you be following all the action with the live stream or blogs? Let us know with your comments. Beginning of new era. This will come out big to finally shove my iToys and crapDroids.